Yesterday was my first time trying out carrot juice. It was... interesting. I was on a little shopping trip with a friend to celebrate the Bank Holiday, and we both found ourselves completely parched at the end of the day. So we decided to grab a juice instead of a coffee... being all healthy and such. Raymy plumped for her usual strawberry and orange mix but I was feeling a little more adventurous and opted for an apple, pear and carrot blend. First thing to note... juice should be ice cold... never room temperature. Shame on you Fruit Boost! The fact that I had to ask for ice for my juice is pretty poor. Except for that initial downer the juice was pretty good. Wholesome, and the pear kept it sweet and mild. I can't honestly say that carrot will be my number one choice of juice but I could see myself ordering it again (pineapple is, and will always be, my number one). How about you? Whats your favourite juice? Have you any recommendations for me to try? I juice daily. Green juice blends are my fave. I juice for the nutritional values and the health benefits. I wouldn't want my juice to be cold. 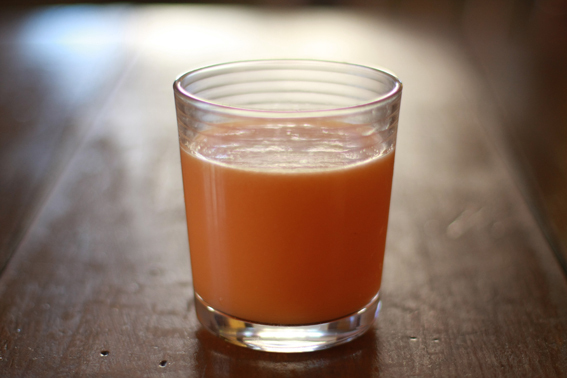 Cold juice means it isn't fresh and fresh juice have higher nutritional values. Sure, you can throw in ice but that'll dilute the flavor. The more you drink fresh juice, the more you'll like the taste of certain flavors. I love the taste of parsley. My favorite blend with carrots are the following. Carrots (3-4), orange, and ginger (an inch). Carrots (3) and beets (2). For some reason my poor stomach just turns at room temperature liquids. If it's supposed to be hot it's hot, if it's supposed to be cold it must be cold... there's no in the middle for me. I'm intrigued at the idea of juicing beets. Are they as sweet as I would think they are? They are and they are absolutely delish with carrots. If you gotta have them cold, buy some mason jars. Fill them to the brim with fresh juice, seal it, and leave it in the fridge for an hour. This is how I keep the juice for E who wakes up much later than I do.